Sosipater (Greek: Σωσίπατρος) is a person mentioned in the New Testament, in Romans 16:21. He is probably the same person as Sopater mentioned in Acts 20:4. According to church tradition, he is known as Sosipater of Iconium, and is numbered among the Seventy Apostles. St. Sosipater's feast days are on April 28 (Slavic tradition), or 29 (Greek tradition) with St. Jason; November 10 with Ss. Erastus, Olympas, Herodian, Quartus and Tertius; and January 4 with the Seventy. 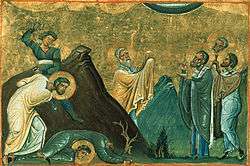 Latin Tradition has it the disciple of St Paul died one 25 of June in Beroea. Born in Achaea, he was Bishop in Iconium (prior to the Apostle Tertius) by his relative the Apostle Paul. With the Apostle Jason he traveled to the island of Corfu where they built a church in honor of the Apostle Stephen the Protomartyr and converted many pagans to the Christian faith. Seeing this, the governor of Corfu threw them into prison where they converted seven other prisoners to the Christian faith: Saturninus, Jakischolus, Faustianus, Januarius, Marsalius, Euphrasius and Mammius, known as the Seven Robbers. The governor had those seven put to death by boiling pitch for their faith. The governor's daughter, the virgin Cercyra, having watched these holy apostles being tortured and turned to the Christian faith, distributed all her jewels to the poor. The governor became angry and put her in prison, yet she would not deny Christ. So he had the prison burned, but she remained unharmed. Many people were baptized upon seeing this miracle. He then had her killed with arrows while tied to a tree. Many believers fled to a nearby island to get away from the enraged governor, but as he chased them his boat sank. The new governor embraced the Christian faith and in baptism received the name Sebastian. From then on Sts. Sosipater and Jason freely preached the Gospel and built up the Church in Corfu until a very old age, when they gave up their souls to God. ↑ "Apostle Erastus of the Seventy - Troparion & Kontakion - Orthodox Church in America". Oca.org. Retrieved 2015-12-29. ↑ "Apostle Sosipater of the Seventy and those with him - Troparion & Kontakion - Orthodox Church in America". Oca.org. 2015-04-28. Retrieved 2015-12-29. This article is derived in whole or in part from Sosipater at OrthodoxWiki, which is dually licensed under CC-By-SA and GFDL. All relevant terms must be followed.